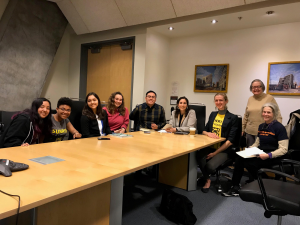 Last week 350 Bay Area mobilized four congressional voting districts (San Francisco, Hayward, Walnut Creek, and Sonoma County) to urge our representatives to support the Green New Deal and it made a SPLASH! Our office visits were part of a national week of action in partnership with a coalition of progressive groups including 350.org, Friends of the Earth, Oil Change USA, Greenpeace, the Center for Biological Diversity, Food & Water Watch, and Climate Hawks Vote. 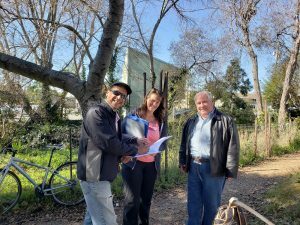 Together we aggregated and delivered 2,481 signatures in the Bay Area alone. Halts all new fossil fuel extraction, infrastructure and subsidies, and transition power generation to 100% renewable energy by 2035 or sooner. Rapidly decarbonizes agriculture and transportation sectors and expands access to public transportation. Ensures a Fair & Just Transition led by impacted workers and communities, including low income and communities of color, without relying on corporate schemes or market-based mechanisms. Includes a national jobs guarantee, creating good jobs with collective bargaining and family-sustaining wages. Other notes from the office visit: We have video footage! Watch it here. 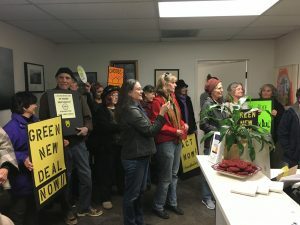 A delegation of eight women from 350 San Francisco, Youth vs Apocalypse, and the Sunrise Movement met with two staffers at Nancy Pelosi’s San Francisco office, while a crowd of 50 supporters demonstrated outside. In addition to the petition signatures, the delegation brought cards with notes written by the demonstrators. Writer and feminist Rebecca Solnit addressed the group outside, while the delegation inside conveyed the urgent need to address the climate emergency to the staffers. They expressed awareness of the emergency but did not discuss any plan for Pelosi to support the Green New Deal. 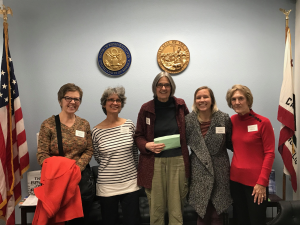 Other notes from the office visit: We met with Amanda Martin at Swalwell’s office. She said Swalwell hasn’t seen the language on it yet, and needs to read it. We emphasized that we want a leader on addressing climate change, and he could be in there helping draft the language. Swalwell helped found Future Forum which had a focus on climate change among other things so you would think this would be a no brainer for him. “I was an early and strong supporter of the Green New Deal in California. In that time, I worked as a member of the California Air Resources Board and the Chair of the Senate Labor Committee to coordinate with the Building Trades and workers at the state and local levels to ease the transition to renewables, which resulted in new, clean jobs for Californians. I have a long history of involvement in this matter, and I strongly support the Green New Deal,” DeSaulnier said. Other notes from the office visit: Eighteen volunteers showed up to deliver the signatures. Stephen Gail greeted us and they were very welcoming. Similar to Walnut Creek, they knew we were coming even though we didn’t have an appointment. We prepared a statement about how the community supports the GND and they provided a return statement mentioning why Thompson had waited to sign on (due to the unclear language of the Green New Deal), but as soon as he saw the official language he came on as a co-sponsor. Want to join the action? Join 350.org’s GND webinar tonight at 4pm PCT to discuss next steps in pushing a Green New Deal forward, and to highlight state/local wins across the country that help lay the groundwork for a Green New Deal. Register here. Thanks to all of our committed volunteers and coalition members who made these empowering and IMPACTFUL events possible! Keep opening our emails to find out how to get involved in the next one.